The aftermath of Hurricane Florence has left a scene of chaos and destruction in North Carolina, but law enforcement says that hasn't stopped criminal thugs from looting en masse. The city of Wilmington, North Carolina, was especially hard hit both by the storm and the onslaught of primitive-thinking lawbreakers who slow the recovery after Hurricane Florence. The torrential rainfall battered the coastal boundaries of Wilmington. The category 1 hurricane destroyed the majority of the city, and it wasn't long until the notorious “usual suspects” were on the march for stolen goods. Local news outlets reported looting of a Family Dollar, and it quickly went viral as Americans watched in disgust. Directly across the street from the Family Dollar is Houston Moore Terrace, which is the largest of Wilmington’s 8 enormous public housing apartment complexes. Those responsible for the looting were, of course, the African-American welfare recipients who live in the vicinity. "When we came over the hill on Greenfield Street, you could just see people everywhere," Chelsea Donovan said. The police response was slow to arrive, as hundreds of worthless criminals were roaming with masks on, or their shirts over their heads. The atrocious behavior of those involved can be compared to nothing less than savages. Amidst any natural disaster, the people of the community should be uniting intolerance and strength, as well as assisting those most in need, as you could save another person's life. Those who committed these horrific acts of theft by way of looting did so simply to take advantage of a situation like this, and it's wrong. Some suggest that employees of the Family Dollar were involved, albeit that has yet to be confirmed by law enforcement. Assistant Police Chief Mitch Cunningham said that a responding officer talked with the owner of the Family Dollar. He initially said he didn't want to press charges, but afterward, Cunningham said the District Attorney and the owner ultimately agreed to press charges. Officers are now working to identify and arrest those involved in the looting. Wilmington Police asked for anyone with information to please use Text-a-Tip or call Crimestoppers at 1-800-531-9845. THIS IS THE KIND OF FILTH THAT NEEDS TO BE ERADICATED FROM THE FACE OF THE PLANET! WHAT KIND OF LOW IQ PEOPLE ARE THESE? NO SPIRITUALITY NO MORAL COMPASS NO HUMANITY! DEMONIC DEVILS! Why would the officers be told to stand down? It's ok to break the law during emergencies I guess. Maggots robbing and destroying their own communities. Hopefully the actual owners won't be out anything and their insurance reimburses them and these scum looters are thrown in jail. Have you seen the Anderson Cooper video of him faking the water depth? He and others have been Hyping the impassible roads, the lack of fuel. The need to get fuel and generators in by ship ☺ etc… etc… But he arrived the next day without what seems any problems. 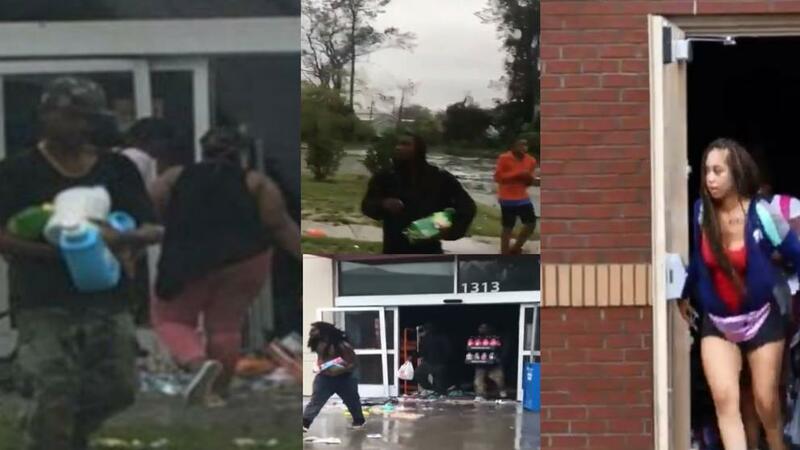 BTW: I quickly noticed these looters don't even have shoe sole deep water.